QBE Insurance Group Limited (QBE) is a large and complicated entity. In fact, the scope of the business and the nature of insurance make it quite hard to understand the business completely. This uncertainty creates buying opportunities, and as Graph 1 shows, the stock has been a large beneficiary of our investment dollar. mandates that share the same investment strategy. 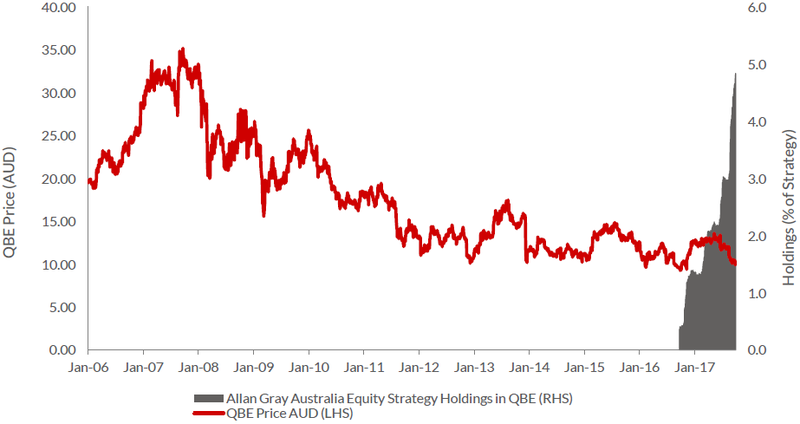 Firstly: Why has QBE’s price plummeted? 1. Many of its acquisitions turned out to be poor and QBE was writing off large swathes of unprofitable business. The past few years have been a sort of insurance purgatory, as the then new CEO John Neal streamlined the business. Every time it looked like things were righting themselves, another issue emerged and investors have grown increasingly weary. 2. In what could be described as a perfect storm, the insurance cycle turned down in 2012. Insurance premium rate increases have been modest or negative since then. This despite the probability of an insurance event occurring not changing over that time and the cost of these insured events often increasing. This is best illustrated in Graph 2, which shows the Marsh Global Insurance Market Index, a benchmark of global commercial insurance renewal rates representing the world’s major insurance markets. The graph shows insurance premium rates in 2017 being roughly 10% below those that prevailed in 2012. This has created a significant headwind for QBE’s earnings. There is reason to be optimistic though. It is our view that the bulk of the heavy lifting has been done and that the business is better positioned today than at any time in the past five years. Also, while we cannot accurately predict the turning in the insurance cycle, it is quite possible that the future is much better than the recent past, as discussed later. How much should QBE earn? QBE generates about US$12 billion per annum in insurance premiums. Its underwriting result is targeted to be 4-5% per annum (in fact, a little higher than this in the medium term, but better to be conservative). If achieved, this will generate about US$500m in underwriting profit per annum. In addition to underwriting earnings, QBE has an investment portfolio asset base of US$25b that is mainly invested in short-dated fixed income investments. Assuming a 3% return on this portfolio is sustainable, these assets should generate a further US$750m in annual returns. Combined, QBE could reasonably be expected to earn US$1.25b per annum in operating earnings before interest and tax – though this term is not standard terminology for insurers. 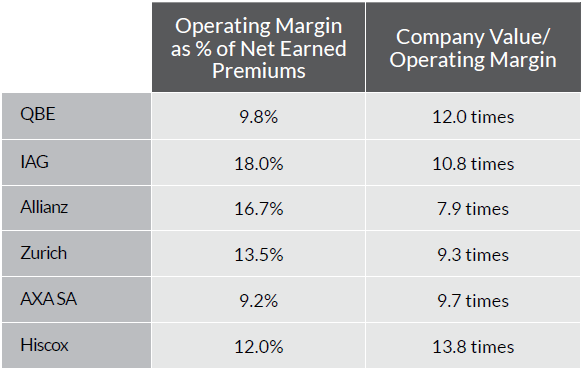 This is an operating margin of roughly 10% of net earned premiums, a figure we consider undemanding considering QBE’s historical margins and those of the insurance industry as a whole (see Table 1). QBE trades at 11 times these earnings. Not only is this well below the levels that the overall sharemarket trades at, there are reasons to believe that future earnings may be better than we have forecast. As already discussed, the insurance cycle has resulted in downward pressure on QBE’s insurance premiums and therefore its earnings. QBE is also dealing with a number of self-inflicted operational issues that we do not believe are permanent in nature. Once addressed, it might turn out that our assessment of the likely level of future earnings is too low. Investment returns on offer are also historically depressed and at some stage, these may also improve. It is unlikely that all of QBE’s headwinds will abate at the same time and some tend to work against others. Nevertheless, an expectation that QBE’s future earnings should improve from today’s levels is hardly grandiose; compared with other insurers, QBE is materially underearning. Table 1 shows the current operating margins of a number of household insurance companies and close peers of QBE. Most of them are significantly more profitable than QBE. One risk we see in QBE, which is worth noting, is its exposure to a housing downturn through its lenders mortgage insurance (LMI) business. LMI is a small part of the business, but it plays quite a significant role in the profitability of the Australia and New Zealand business. The business is reinsured to a certain extent, but a major (40-50%) drop in house prices, coupled with unemployment rates in double digits, will be bad news. We have done a lot of work to try and quantify what these losses could look like, and are comfortable that QBE could sustain them, far more so than a bank, for example, would sustain its exposure. It is also possible that we have overestimated management’s ability to restructure the complex beast that QBE is (noting that QBE will have another new CEO, Pat Regan, in 2018), or that events outside management control (such as an enormous catastrophe which exceeds QBE’s reinsurance limits) conspire against the company. However, investment is a game of probabilities, and we see our best opportunities, like now with QBE, precisely at times like these when expectations are low. The problem with QBE is not about markets or catastrophes, it is management. For the past 8 years at least it has been run by bean counters who lack underwriting background. Counting the $ is one thing, wisdom (experience) in assuming risk and pricing it properly is vastly different. When you look at the QBE lineup it is a board of administrative types, employing administrative types. All I can say is sayonara baby! @James Taylor, I would have to disagree on a few counts. Under Pacman O'Halloran, QBE took on too much and was getting to the point of being unmanageable, as confirmed by the number of issues that were incessantly popping up and their financial consequences. Under O'Halloran, management was viewed as arrogant and abrasive. We have been through a 'soft' market for insurance premiums for a number of years now with a lot of capital headed into the insurance and reinsurance market. The recent huge hurricane catastrophes may result in a 'hardening' of premiums but that is a point to look at in 12 months time to judge.. QBE has incessantly restructured which suggests a preponderance of short term thinking, panic planning and limited direction. Hardly a recipe for success. There is a decent business there waiting to get out but, like many, it has been au revoir and sayonara !